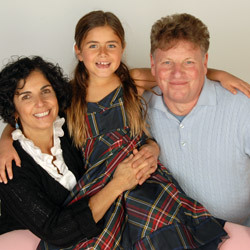 Dr. Rachele Ferraro with her daughter and husband. In my early 20’s, my life was changed by a chiropractor, who uttered the words of wisdom mentioned above, and by a neck injury. The philosophy of chiropractic, that by removing the interference to the system, the body can heal itself, also spoke to me. The rest is history. My chiropractic training was done at University of Western States in Portland, Oregon. It was fascinating to study the physical body in such depth. To see where everything attaches, to learn the intricacies of the joints and their motion, to study thousands of x-rays, to learn about the importance of the nutritional building blocks of the body, to memorize the neuronal pathways in the brain and spinal cord, and to learn to feel the different qualities of living tissue. Since then, I continue to study many healing approaches ranging from the subtle and energetic to the biochemical and neurological. For the moment, I’ve put my studies towards a Master’s Degree in Human Nutrition on hold to also work a few days per week with a multi-disciplinary team of practitioners collaborating to provide truly individual, in-depth, integrative health care. Anatara Medicine is the only practice of its kind: the only clinic to provide a thorough synthesis of the best of modern and traditional, Eastern and Western medical disciplines. We call it Convergence Medicine. When patients come in to see me for care, they benefit from my love of learning how to better serve them, as new information and techniques are incorporated into the care they receive. My goal is to help people get healthy and stay healthy, in a natural, caring, compassionate, effective, and timely manner. I ‘m married, with a wonderful husband and child. For fun and relaxation, I enjoy doing yoga, cooking with my family, knitting, jewelry making, bike riding at Crissy Field, outrigger canoeing on the Bay, reading bedtime stories to my daughter and doing crossword puzzles. For my personal health, I get regular adjustments and take whole food supplements and herbs. I also strive to have a good diet, get enough sleep, be mindful of my thoughts, and get regular exercise, massage, acupuncture, and energy work. As a wife and mother, I understand the challenges of a trying to maintain a healthy lifestyle for my family. My daughter was adjusted shortly after her birth. The frequent coughs and colds she had during the her first couple of years of life were cleared up with the whole food supplements and herbs that are now part of my practice. Since then, she enjoys vibrant good health and is rarely sick. Our chiropractic office is located on Market Street in the heart of San Francisco. Give our San Francisco chiropractic office a call, or email me using the link below so we can set up a time to help you take your first step towards better health. Also affiliated with this office, click here to review.